I think the real question is still: how much of the ol' girl's charm do you want to retain? are you wanting a mostly stock old Jeep to tool around in? or a restomod that looks old, but comes with the conveniences of a modern drivetrain to be a more comfortable daily driver? I'd like to keep all the charm! In its current state, it's definitely modern enough to be a comfortable (enough) daily driver if it had an engine I didn't stress over. Not sure I can completely answer your question though, Pete. I'd like a mostly stock Jeep in terms of simplicity... not necessarily that it needs to be correct for 1975. 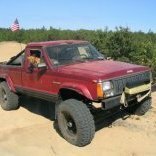 Can I have a mostly stock looking old Jeep to be comfortable driving across the country? I've been known to let my engineering side get ahead of my common sense side now and again and I can totally get behind a complicated swap, but my gut just feels like a 4.0 block/heads/(intake/exhaust?) would be the way to go. stockish with modern innards. I'd probably even go and paint the valve cover and intake a dark color so they blend in rather than be all blingy. #oldirondeservestolookold? I guess I can't really comment on the transmission though, as I haven't driven a non-od trans yet. Trying to think of options while retaining the passenger side drop front axle. Advance Adapters says an AX15 will never fit. You can bolt a Dana 300 to an AX15. They are much shorter than a 231 probably 6 inches or so. Trouble is that an AX15 is probably at least 6” longer than a T176 or T150. Can anybody get a measurement of the length of a T176 from the front of the bellhousing to the center of the ujoint in the output yoke. I have both AX15’s and Dana 300’s and give you an overall measurement. Just read this thread and found it interesting. As some may know, I wheel an 83 CJ7 I've owned since 1995. It had the 258, then a 4.0HO for about 10 years, now a 5.3. I'm also building an 80 CJ5, exactly because I have a tried and true 4.0HO complete setup sitting on the stand from the CJ7. After getting the 5.3 running, I strongly considered (still considering?) doing a 4.8/5.3 in the CJ5 because they are awesome motors. But that defeats the purpose of "I can build one from parts I have laying around, just need a frame, tub, & title". I'm not a fan of AMC V8s. There, I said it. Yes, they are a bolt in. But still, not a fan. I don't understand LS swaps with a carb, and 4.0 swaps with a carb fall in the same category. I get it, some people don't and won't ever understand how a transistor works, but still. Modern computer controlled fuel injection is the way to go. The only reason I swapped out my 4.0HO was going to 35s. Even with 4.56 gears I was always in the throttle to keep up with traffic in town. Highway and off road, I was happy (4:1 gears in the D300). I've built custom engines. My advice for someone who actually drives their vehicle (not trailer queens or weekends only), is pick the motor that makes the horsepower you want, and put it in. I've spent a lot of time tuning, adjusting carbs, changing timing curves, etc., and I don't miss it. I have a factory air cleaner for the 258, for the power brakes setup. It is offset from the carb and sits over the valve cover to make room for the power brake booster. I've thought about adapting that to the 4.0HO so that when I raise the hood, people will look, and then say "waitaminuit...". Even funnier, I am thinking of running hydroboost on the -5 like I do in the -7, which makes the sleeper air cleaner even more pointless. I run a 3550 in my CJ7. I've thought about running my spare 3550 in the CJ5, or getting a AX15. Even if I was to get Novak's super short D300 rear output, I don't see how it would fit. I have the CJ-5 down to the frame, and can mock everything up. It doesn't fit. It looks like you aren't even considering a T5? I know they have a horrible reputation, but like the D35, people still use them. That was the factory 5 speed for the 258. My CJ7 had one originally, which I swapped for a T18, then for the NV3550. I have a T5 now and plan to use it in the CJ5 with the 4.0HO, D300, 3.73 gears and 30-31" tires (no lift). From the outside I want it to look completely stock, except for a period correct Alpine cassette deck in the uncut dash panel. If the T5 mushroom clouds, I have the T18. Loose overdrive, gain strength, 6:1 first gear, and longer rear shaft. I don't understand LS swaps with a carb, and 4.0 swaps with a carb fall in the same category. I’m easily in the same boat that I don’t understand a downgrade like putting a carb on a modern engine that was engineered to function properly on fuel injection. Just like anything else, there’s loopholes that I can understand. What justifies this for me is the idea of a “modern engine”. The base engineering of the 4.0 goes back to the 258/232. I know... I know... there are several big differences between a 4.0 and a 4.2. What about the similarities though? I view the 4.0 as an engine that got upgrades to keep up with the times. Would a 4.0 pulled from a WJ run better on its fine tuned electronics? You bet! 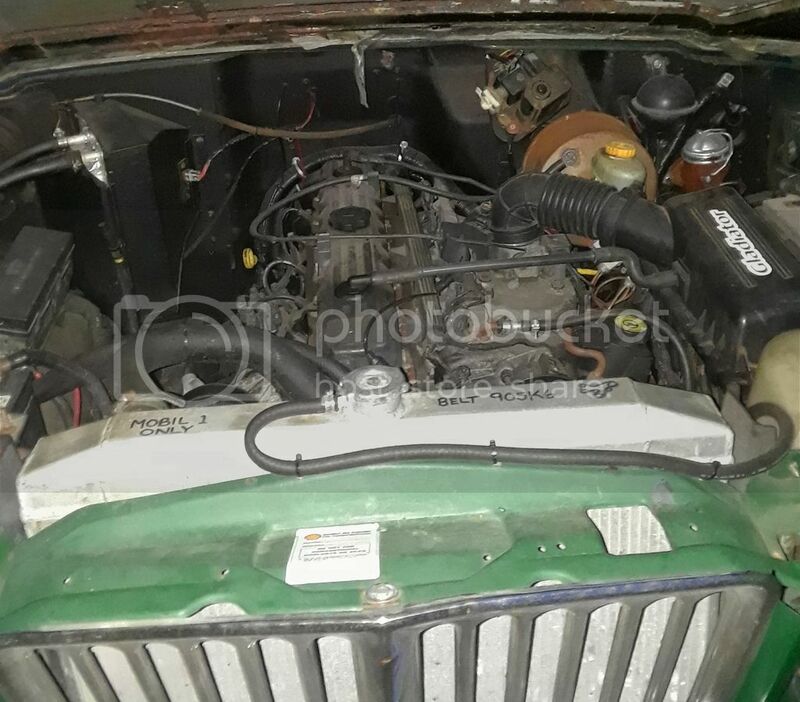 Would it run on a carb/throttle body injection? Why not? Of all the 4.0 intakes I think the later model horseshoe style would be the best choice for this. Just like putting together vehicles with parts we’ve got sitting around, I’d throw this topic under that umbrella. My Jeep has a dwindling engine. 4.0s donors are abundant. I like the simplicity of my throttle body injection/DUI distributor (and I already have them). Cost is also a part of the equation. I know I could pick up an entire donor vehicle and part it out. Might even come out ahead. I’d prefer to not have a parts vehicle sitting around right now. Salvage yard 4.0s can still be had with 150k miles or less too. So many of these don’t come with wiring though. Given the opportunity at a good price I would drop in a reman 4.2 and be done with it. Again... cost. I do come back to the thought of a downgrade. What gets me past it is the idea that whatever I put in my little CJ will be some kind of an upgrade. If it comes down to getting a better condition engine as inexpensively as possible, I can understand a 4.0/carb swap or retaining the TBI. I've lived on a tight budget, so I most certainly understand cost is a concern. Along that line, a 4.0 still makes sense. A junkyard 4.0 will (probably?) be cheaper than a reman 4.2. It is well known that a cared for 4.0 will go 300k. So I wouldn't be scared of a 200k motor. 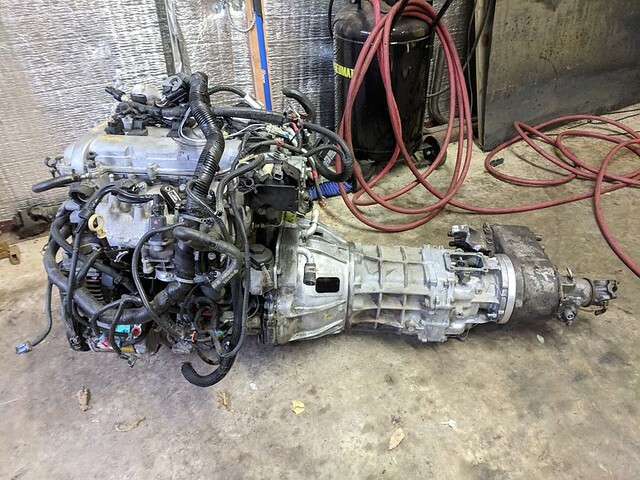 If it did die an early death, another long block from the junkyard is cheap and since the conversion work is already done, it's a cinch to install. I don't know about anyone else, but it's been a few years since I saw a junkyard 4.2. You can throw a rock and hit three 4.0s. I get it you already have the TBI, and that's a big reason to go that route, but I disagree that it is simpler. MPFI requires 4 or 5 more injectors and the wiring for them. That's basically it. I guess it might LOOK more complicated. I like the simplicity of the 4.0 distributor- no timing adjustment, ever. Plug it in and lock it down. My nice Snap-On dial back to zero timing light/tach has sat in it's case for over 10 years and I'm ok with that. I'll just say that putting in the MPFI 4.0HO was one of the best mods I ever did to my Jeep. Before the swap, I would test drive this one very steep hill in 4wd low. Keep in mind, my 4.2/BBD carb ran VERY well. Still, I would have to modulate the throttle to keep it crawling up that hill. That hill was the very first place I went after the 4.0 swap. Not only did I not have to modulate the throttle, I could keep my foot entirely off the throttle. AND I could press on the brake! After a moment it would start to stumble, let off the brake it would smooth right out and keep climbing. I was sold from there. Not only off road, but daily driving. Cold start at -10 degrees? No problem. These are just my opinions and experiences. And I enjoy talking Jeeps and engine swaps! I should probably add that the 4.0 swap happened after a promotion at work, when I was finally starting to make enough that I could afford to spend on my hobby after normal living expenses and saving was accounted for. Any thoughts on the longevity of a 4.0 in front of a T14 three speed? They rev a little better than a 4.2 but with the tire size I can’t imagine that’d be much of a point of argument. Not that I’d be worried about the 4.0, but more so if anyone thinks that long term a 4.0 would be a better choice. I wouldn't be worried about the longevity of a 4.0 at all. I've had two go over 300k. Leaking o-rings at the oil filter adapter. Replace them (they're cheap) and your good for another 250k. Cracked exhaust manifolds. All the OEM ones crack eventually. Later models went to two piece cast manifolds to solve it. Replace your cracked one with a cheap aftermarket replacement with "bellows" on the outside pipes. Adding a flex pipe in the exhaust system is also a known way to prevent future cracks. Crankshaft and (to a lesser degree) Camshaft positioning sensors. If you are doing a carb or TBI conversion these won't matter, but if keeping the MPFI, these sensors can leave you stranded. Replace with OEM whenever possible. I've never experienced a second failure after replacing both one time (on different engines). Motor mounts cracking (driver side a little more common) but that's not really an engine issue. And that's about it in my experience. Correction... my tape measure says that an AX15 would fit within the stock wheelbase length with the use of a Dana 300 transfer case. This would obviously cut a hefty length out of the rear driveshaft, but who needs tubing anyhow? This gets me thinking again. how short are we talkin'? I wouldn't worry about the longevity of a 4.0L in front of a three speed transmission. Wranglers were shipped with three speed automatics througout the YJ and TJ years. I'd vote 4.0L HO, and am suprised you didn't see more of that recommendation given your requirements. It is more wiring. But, the 4.0L HO adds the durability, reliability and horsepower you're looking for, and doesn't break the bank. Novak will machine a T18 bellhousing for a 4.0 cps. I think just for the Aisin Warner style not the Chryco automatics with the round style cps. That is true Frank, but in my situation the T18 was pre-AMC and the bell would not bolt to the 4.0 due to a different pattern. The AMC years T18 was a different setup. I ended up using a T176/T150 bellhousing from a CJ and made a bell to trans spacer myself since they didn't offer one. I have one of those T18’s also from behind an amc 327. It has a Dana 20 with a drum style emergency brake on it. If it'll fit in a CJ3B, then I know it'd fit in a CJ5. Not that I've got any of these components sitting around, but there are plenty of GM donors. Sure would loose some of its character but I think it'd gain more in reliability and the ease of locating a good donor. Hmm... I'd better find a job. So... I've been thinking again. I found an article from Four Wheeler from a while back when they bolted in a 4.0/AX15/Dana 300 into a CJ7. The rear driveshaft ended up being 20.25". If you figure my little CJ5 is 10" shorter in wheelbase than a CJ7, I'm not sure if I'm comfortable with a 10" driveshaft. Let's talk about the T5. Been doing a bunch of research today about them and it's a real mixed bag of opinions. Looks like the 3rd gear is the week link in the whole package but I'm seeing more horror stories from people trying to go way above and beyond what you should with a T5 anyhow. My current T14 three speed is also in that same boat of being classified as a lighter duty transmission. I don't see myself using my Jeep as a real rock crawler. Rather I find myself wanting to go out into the mountains exploring back roads. The gear ratios of the T5 are 4.03, 2.37, 1.50, 1.0, and .86 while the T14 has a 3.10, 1.61, and 1.0. A lower first gear would be nice and obviously I'm still after an overdrive. If you look at the AX15, it's got 3.83, 2.33, 1.44, 1.0, and .79. Comparing a TJ on 33s and 4.10s or 4.56s with an AX15 would be real comparable to my little CJ on 33s and 4.27s with a potential T5 in it. Not sure if I've got a question in there... more so just thinking out loud. Anyhow, tell me more about your CJ5 plans. I try to be brief, haha. I pulled the 4.0HO out of my CJ7 that had been in there about 16 years. Put in a 5.3 Chevy. Plan was to put the 4.0 in the CJ5 with better brakes, and everything else basically stock. Sort of a sleeper. Using a T5 and 3.73 gears and stockish 30" tires it should be a great driver. Well, the 5.3 in my CJ7 is so much fun that I am now moving towards putting a 5.3 in the CJ5, using a Sm465 4 speed, and 3.54 or 3.73 gears, 2-3" lift and 31-32" tires. Should still be a good driver, be able to start out in 2nd gear, run ok on the highway, and with the low first gear be good off road. I also have a 4:1 gearset for the Dana 300 that would actually make it lower geared than my CJ7. But for stockish sized CJ that won't be heavily abused, a good condition T5 would probably last. I pulled the original out my CJ7 in 1998 to put a T18 in for the lower first gear. It still worked fine. It took some getting used to the T18, which shifts like a bread truck, versus the T5 that shifts like a sports car. But the low first gear made it worth it. The ICON CJ3B is really cool. I remember studying it closely when articles came out about it. I wonder how much shorter the Chevy 4 cyl is compared to the 258, and if you can mount it further forward to give more room for rear driveshaft length. I'm guessing you could gain upwards of 6", giving room for a 5 speed. Use Novak's super short D300 output would probably result in a rear driveshaft length that was livable. The shifters for the 5 speeds are pretty far back, so it wouldn't be real far forward on the floor if you pushed the whole drivetrain forward. ... I wonder how much shorter the Chevy 4 cyl is compared to the 258, and if you can mount it further forward to give more room for rear driveshaft length. I'm guessing you could gain upwards of 6", giving room for a 5 speed. Use Novak's super short D300 output would probably result in a rear driveshaft length that was livable. The shifters for the 5 speeds are pretty far back, so it wouldn't be real far forward on the floor if you pushed the whole drivetrain forward. This is where my head is at too. These little engines are super tough and reliable. I think cost is really what would keep me from this swap.